One of the groups of the “travelers” was detained at about 2 a.m. by the border guards of Lviv Detachment. The foreigners arrived to the border by two taxi cars. The border detail, while checking the vehicles on the highway near the border found four men inside the car. They introduced themselves as the citizens of Iraq, Lebanon and Afghanistan. However, only the Lebanese had some documents, and the Iraqis provided the copies of the foreign passports. The foreigners tried to convince the border guards that they arrived at night to the controlled border area to have dinner at one of the eateries. Later they all admitted in their intention to get to one of the EU countries for future employment. Currently, the detainees are in the border unit, where all the circumstances of their journey will be established. 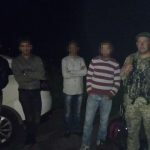 Two more seekers of a better life were detained in Transcarpathia at about midnight in the area of the BD “Velyka Palad”, Mukachevo Detachment. The foreigners made their way to Hungary. The quick movement of the unknown persons, who overcome the barrage fence, was fixed by the border guard. In order to detain the offenders, the soldiers fired warning shots up. The detainees did not have documents. They only reported to be the citizens of Afghanistan. To clarify all the circumstances of the offense and drawing up administrative reports the offenders were taken to the border units. The further destiny of the detainees and the degree of liability will be determined by the court. This entry was posted in Translated Media-News from Ukraine and tagged Afghanistan, EU, Hungary, Transcarpathia on July 22, 2018 by oksana.